As a mom to three little ladies, we have quite the bow collection over here! In fact, when I found out I was expecting our first daughter, Avery, I'm pretty sure the first "girl" item I purchased was a bow! I think my daughters are absolutely beautiful whether they have bed head, or sit still long enough for me to brush their hair, but there really is something so sweet to topping off their hair styles with a bow. I know they won't be wearing a bow forever, so I'm going to cherish these sweet little childhood memories while I can! Now, organizing ALL the bows, headbands, hair clips, hair ties, etc., can get a bit crazy! Over the years, I have found a few SIMPLE, easy, budget friendly ways to organize and display our favorite accessories. 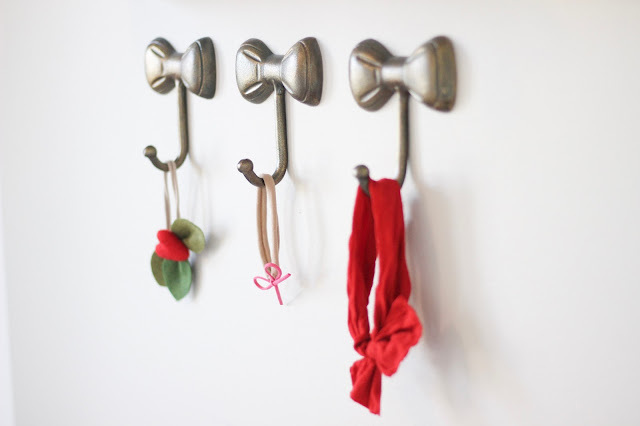 I'm all about "functional" decor, decor that is pretty, but also serves a purpose and bows fit right in to that category! 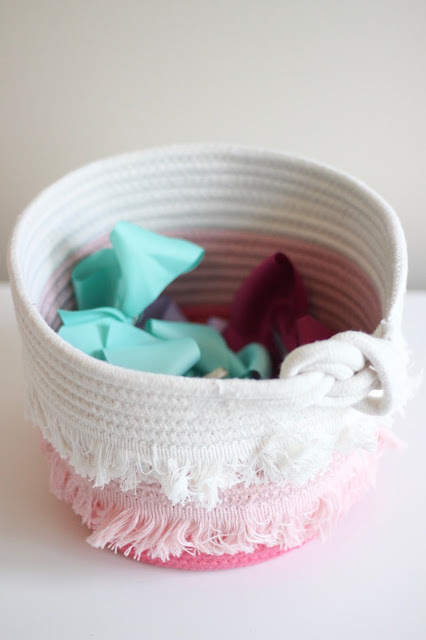 Below are five easy ways to organize and display your little lady's bows. In my oldest daughter's room, I started displaying her accessories on a tray on her dresser. 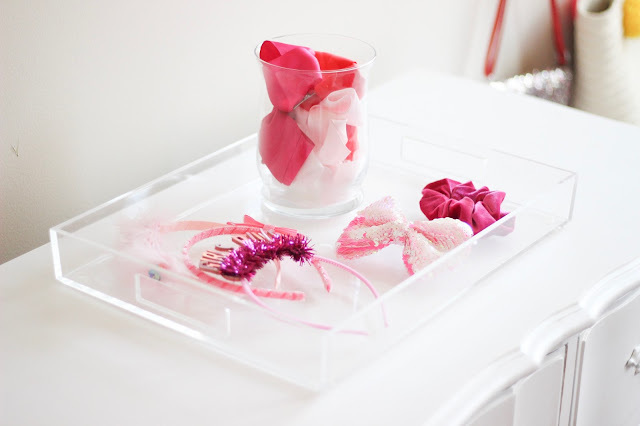 I keep a few seasonal headbands, hair clips and a jar of seasonal colored bows on the tray. She has found a new independence for getting dressed (#allthepatterns) and selecting her hair accessories (#allthesparkles), so this is an easy way to narrow down some choices. The tray also looks super cute on her dresser, which is a bonus! Here is an example of a tray I would keep in my middle daughter's room, she loves to wear her hair in "panda" buns, so I added some of our favorite Ryan & Wren clips to her tray. 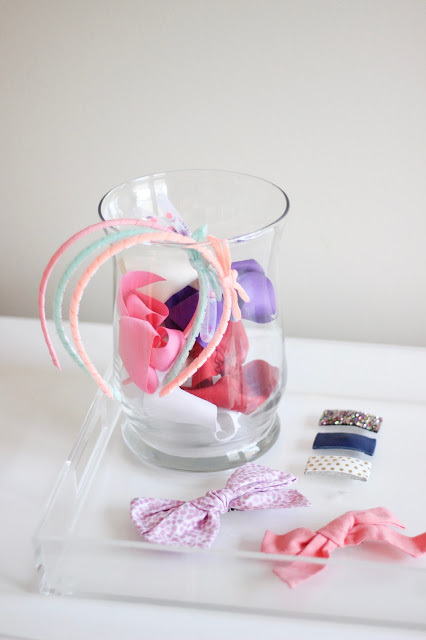 You'll notice I also simply stuck a few seasonal colored headbands in her jar of plain bows, an easy way to keep them from getting bent and broken! These photos are from my littlest lady's room! 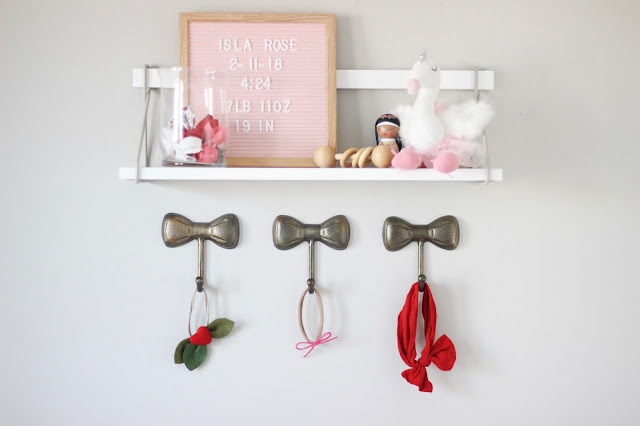 When I was planning her nursery and came across these adorable gold bow hooks, I knew they would be great for displaying some of our favorite baby headbands, while also being super convenient for grabbing a headband while getting her dressed in the morning. 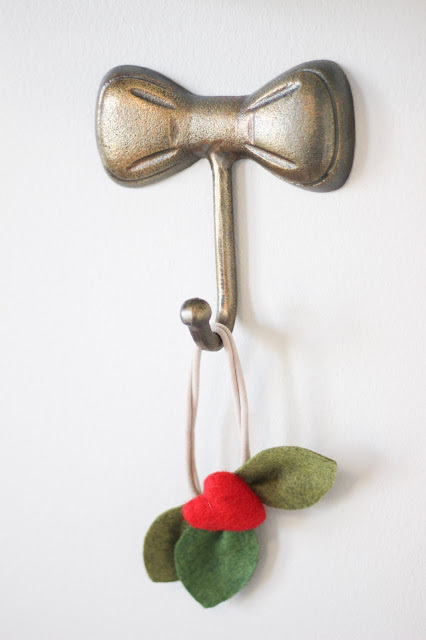 I also love how I can display holiday themed bows to give her room some festive touches throughout the year! Now, what to do with all of the bows that you're not using on the tray!? I have two storage solutions, one is DIYing or buying a bow hanger! My sister-in-law gifted this to Avery and I have it hanging right inside her closet. 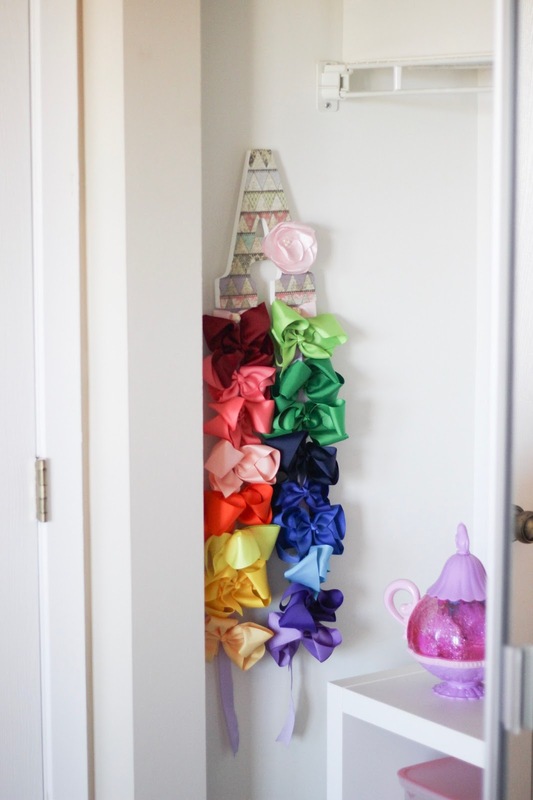 It keeps the extra bows super organized, it's easy to get too and again, adds a super fun girly touch to her room! Last but not least, for my other two daughters, I store all the bows they aren't using in a cute storage basket inside of their closet. Each month, I can pull out the new colors or festive patterns that I know they will be wearing and I store the rest out of sight! I can't stand clutter and when all the accessories are jammed into one space or container, a lot of times they get broken or forgotten about. This is an easy way to simplify and allows you quick access to what you will be needing on a daily basis. 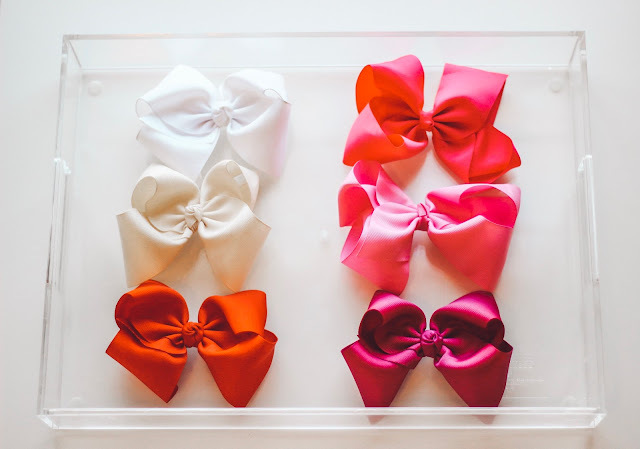 If you're a girl mom or about to become a mother to a little lady, I suggest starting off your bow collection with just the basics, grab some solid colors that you know baby girl will be wearing with majority of her outfits, which in our case is: white, pink, black and grey. Splurge on one or two special/unique bows for newborn photos and don't forget to grab a sweet little hat or bonnet for when you take baby girl home from the hospital! 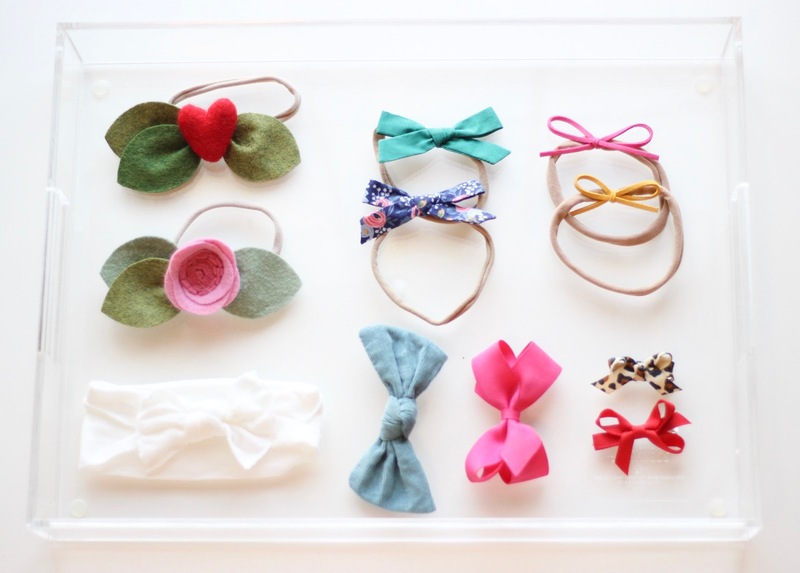 There are SO many adorable options when it comes to bows and headbands, below I have rounded up some of our favorites! I prefer headbands on the skin tone nylon headband and would also highly recommend Baby Bling bows for the softest headband option, I "just say no" to tight elastic headbands! Hands down, the BEST quality classic bows are from One Stop Bow Shop, the grosgrain material is super thick and they are nice and secure on a metal alligator clip. We only wear bows on alligator clips, they are much easier to slide in and out and work great with multiple hair textures. I have bought bow bundles off of Amazon and while they are a GREAT value, they are often the first to fall apart. 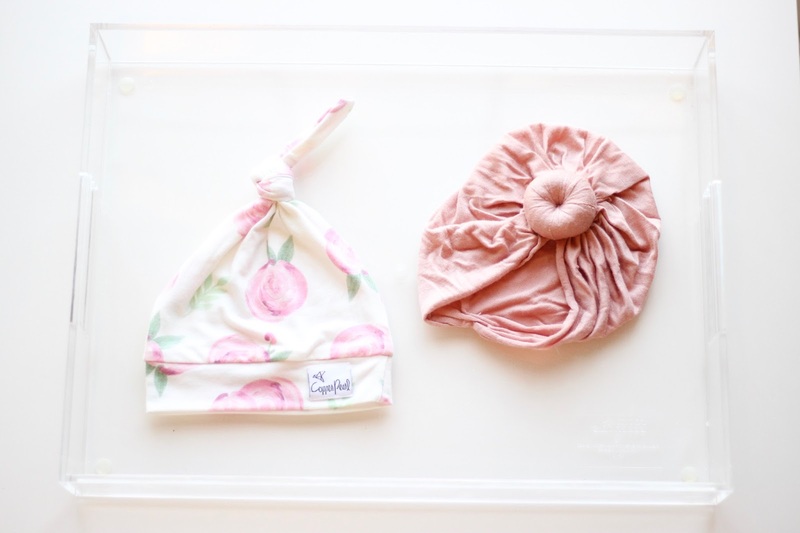 Bonnets are so timeless and just so darn sweet on a fresh little baby! I also love the tradition of an Easter bonnet and used the white bonnet for both Emerson and Isla's first Easter, such a precious keepsake! Well, I have never felt more like a "girl" Mom then snapping photos and writing the content for this post! One of my favorite parts about being a Mama to all girls is being able to hand-me-down some of our most loved and cherished pieces! It melts my heart when I get to put on a hat or hair bow that Isla's older sisters wore when they were babies, it just doesn't seem possible that my older girls once wore the same little hair bow when they were babies. 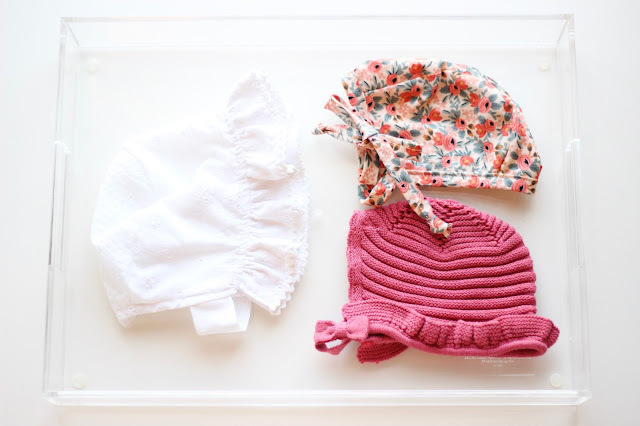 I keep the hats my girls wore home from the hospital, as well as their special birthday crowns or bows in their memory boxes and when I randomly decide that I need a good cry, I take them out and holding those tiny little accessories in my hands floods me with all the memories of when they were small enough to fit into them. These sweet girls are our whole world and I'm so happy I get to share little pieces of our life with you!